Solid-state storage is getting cheaper almost by the day, so it is no surprise that users are starting to put more than one SSD in their workstations and desktops. Personally I have had at least three SSDs in my main workstation for two years now. 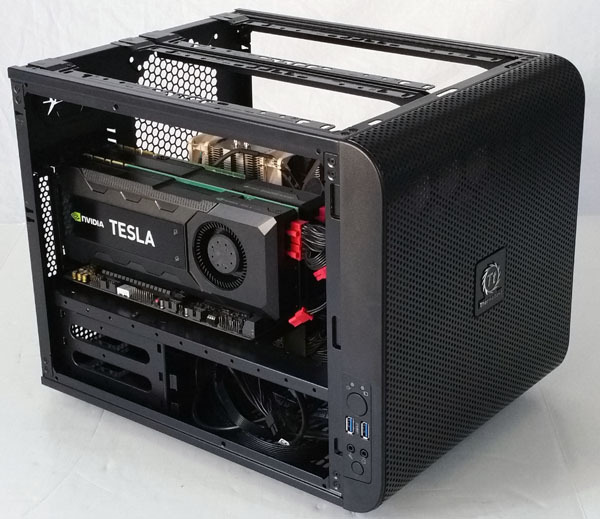 Thermaltake sent its solution, the Thermaltake MAX-1542 hotswap enclosure that puts four 2.5″ hot swap drive bays into a single 5.25″ drive slot. Old-time users of this site may remember I used similar 4-in-1 devices with my old 8x 15K rpm SAS setup. At that point I used two Athena Power 4-in-1 hotswap enclosures but came away thinking that they were not the best in terms of noise, especially cooling 15,000 rpm 2.5″ SAS drives. Let’s see how the Thermaltake MAX-1542 unit compares. The test configuration for this series is going to be my single-processor LGA 2011 test bed. Overall, this provides a good mix of drive connectivity alongside a fairly fast test platform. 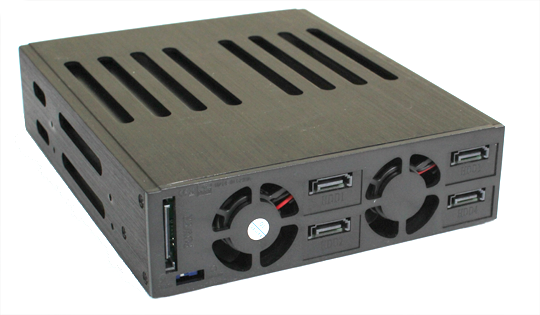 Thermaltake sent their MAX-1542 enclosure that fits four 2.5″ SSDs in one 5.25″ bay, normally reserved for full size optical drives. The product itself looks really sleek with a black enclosure accented by red plastic door levers. These products are great additions to the HP Microserver N40L where there is one free 5.25″ bay or even desktop enclosures. 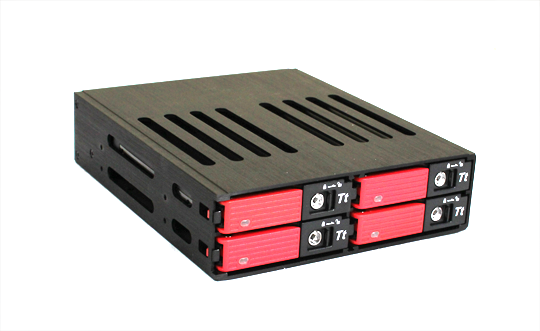 The SSDs are installed into four individual hot swap trays. As one can see below, there is a large piece of plastic covering drives which I cannot figure out why Thermaltake adds other than to make normally thin SSDs thicker. Personally, I wish Thermaltake decided to use the room afforded by this plastic piece to make a tool-less design. One can also see the locking mechanism for which Thermaltake includes two keys, very standard practice with these units. Frankly, if someone has needle nose pliers, these locks are not going to do much good for theft protection. What they will do is prevent accidental removal of the trays. A tip here is to keep the keys nearby in the event of a failure. The rear of the chassis is very interesting. One can see the dual fans, four SATA ports and one SATA power connector. One piece of advice here is that using right angle SATA connectors can be very problematic as right angle connectors attached to the top ports will generally block the bottom (I tried five right angle cables and only one did not exhibit this behavior.) Right angle connectors on the bottom ports may interfere with anything below such as an optical drive or chassis. Installed in the Corsair Carbide Series 500R‘s bottom 5.25″ bay, there was interference using right angle connectors. Frankly there are two easy fixes. First, just use straight SATA connectors either through standard cables that come with the unit or by using a SFF-8087 breakout cable from a RAID card. Second, one can just play with the connectors a bit. I was able to install four right angle connectors but doing so exerted pressure on the SATA connectors. On a review sample, I was willing to take the risk that I might break the backplane and given my personality I would have done so if I purchased this normally. With that being said, some users may have second thoughts with exerting this kind of pressure on SATA connectors and will want to use the straight cables that come with the MAX-1542 or use longer versions thereof. This enclosure reminded me a lot of the Athena Power BP-SATA-1842C units I used with 15K rpm SAS drives that I used years ago. The side vents on the Termaltake unit are much larger, there are no SAS connectors on the Thermaltake unit, the Thermaltake unit is powered by a SATA power connector not a Molex connector, but nonetheless, it seems rather similar. The rear SATA connectors match the rest of the unit and are flat black. Looking inside the unit with trays removed one can see that there are standard SATA data and power ports for each drive. Overall, this is a very simple design with the data ports exiting to the rear and the power being broken out to all four drives. I will say that the fans were really quiet compared to enterprise-level components. Trading plastic tray components for something that is not overly offensive to the ear in a workstation is something I think a lot of people will be willing to do. I will note at this point that I do not think that I would put warm drives as I did with the Athena Power units into this enclosure, but that is not the point of the Thermaltake MAX-1542. 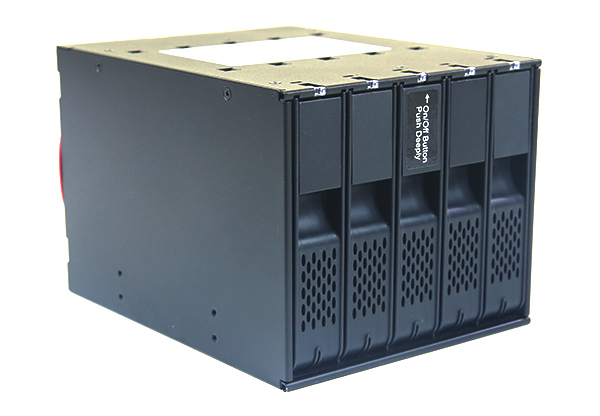 It is instead a unit designed to be used with SSDs which generally run really cool. In terms of performance for the intended application this works. Overall, for those looking at a consumer 4-in-1 for solid state drives, the Thermaltake MAX-1542 is a great option. It is relatively quiet which is much better than those units intended for servers. For those users that want hot-swap SSD trays and have limited space, this is an excellent option. I tried nine different drives in the enclosure and all fit without issue. I will say that this would have been slightly better if Thermaltake were to use all metal drive tray mechanisms and a color other than red. Just looking at the all black Carbide 500R chassis the red handles really pop out. I may be in the conservative minority on this one, but black would have been just fine for these. 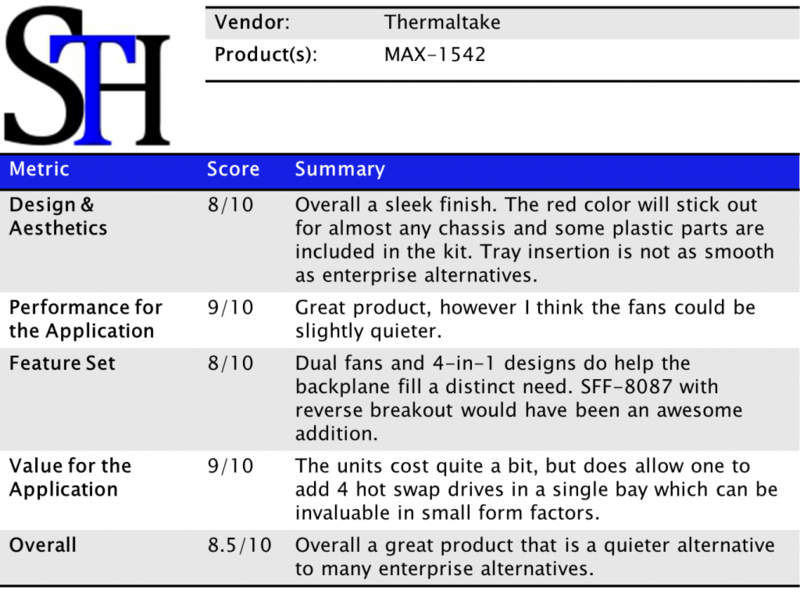 The Thermaltake MAX-1542 did a great job and nearly earned a 9/10 to the point that I delayed the go-live of this piece a week just because I was unsure of a 8.5 versus 9.0 overall score. In the end, for those users that need this kind of density, and that do not mind spending the money, this is a great option. Two of these can be used with an inexpensive controller such as the IBM M1015 to get a nice eight drive 6.0gbps subsystem. I was wondering about these and think I will pick one up now. Thanks! BTW what color are the included SATA cables? Red to match? Any chance of you getting one of the 6 drive models (MAX-1562) for a review? I’m having trouble finding ANY e-tailer that has these backplanes in stock. The MAX-1562 is sitting next to me. Review will be online next week. Here is a link to the Thermaltake MAX-1562 in stock at Amazon.com with free shipping. Have you been able to verify/test the 6GBs spec? Can one assume there is no “insertion” loss or performance degradation when using the SSDs in the trays vs. the same SSDs without the trays? 6.0gbps works fine and I have not seen any performance loss to date using the backplane over a direct cable attach to the drives.